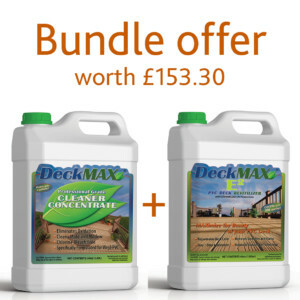 Use DeckMAX Deck Cleaner Concentrate before applying the E2 PVC Deck Revitalizer. The Professional Grade Cleaner Concentrate is industrial strength and comes in a concentrated formula that makes up to 3-5 GALLONS of cleaner. This highly concentrated cleaner MAKES ENOUGH PRODUCT TO CLEAN UP TO 2000 square feet. It offers superior performance on all deck types including PVC (vinyl), wood-based composites, and wood decks. The Cleaner is so versatile it can also be used for many areas around your home including vinyl, metal, aluminum, flagstones, pavers, etc.